I've got a virtual machine running Server 2012r2, and I'm trying to install Reckon. 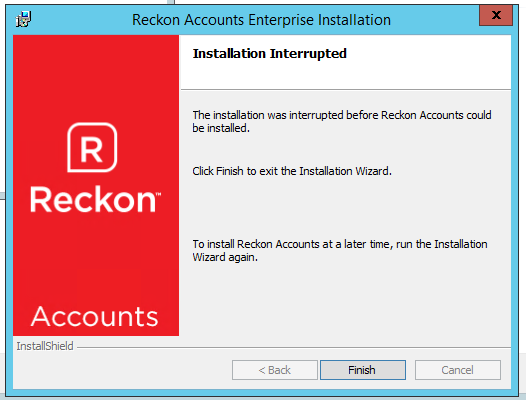 "The installation was interrupted before Reckon Accounts could be installed. Click Finish to exit the Installation Wizard." The print server is currently disabled, and I already installed the database host last week. My goal, is to have Reckon working over Terminal Services. Always do a clean install (no previous installations of RA of any type uninstall if need be) Install after a restart, double check all services related to RA are remove or shutdown. No Antivirus, No Ransomeware or other Group Polices blocking access. Run as Admin. I very rarely use the winzip executable to install. use selective startup if need be. However that is only so unnecessary services don't start. Reckon works perfectly over Terminal Services so you shouldn't have any issues once installed. It was the database server, specifically the service it runs that was blocking the install. I had a second install of reckon somehow too. Even though this install failed, reckon was still on the server, not just the database server. It would not launch, it would just do nothing when clicked. So after uninstall, and reinstall it works.